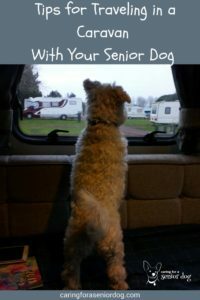 Have you been caravanning for years and just welcomed a new senior dog into your life? 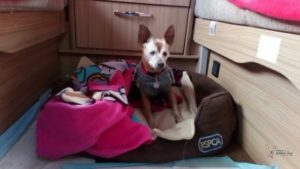 Or have you had a dog for years and are about to embark on your first senior caravan experience? Either way you’re setting off on a new adventure and this article will help make it amazing! I say caravan but of course these tips apply to motor homes as well! Is it really a good idea to bring an old dog? Before we even get started, it’s important to determine if bringing your old dog is a good idea. You may not be able to answer that question yet, perhaps you’ll have a better idea by the time you reach the end of this article. Are you bringing him purely because you’ll be miserable without him, or is bringing him along the only way you’ll agree to take a break? Do you not trust anyone to look after him because he needs specialist care? Hey, I’m with you on all these reasons!! I’m not a caravaner either, but if you want a vacation and want to bring the dog with you it’s not a bad compromise. Perhaps a short test trip with your pup, even just overnight, is a good idea. Bringing your dog along will be fun, and you’ll be more relaxed having him with you, but it doesn’t mean some sacrifices won’t be made. If you’re not comfortable leaving him in the caravan while you go out, then the dinner in that restaurant you’ve had your eye on probably can’t happen. Bright side? They may do take out! What kind of activities do you want to take part in at your destination? If your plan is to move little and relax much and your dog feels the same way, you’re in luck. What if you decide to check out those hiking trails but your dog’s arthritis is acting up and he isn’t able to join you? While in a moving vehicle your dog must be restrained, whether that’s with a harness and seatbelt, in a carrier or crate. 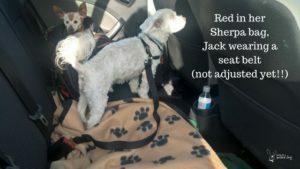 I use a Sherpa bag for my sweet old girl Red, a harness and seatbelt for Jack. If you will be leaving your dog in the caravan while you’re out, putting him in a crate may make him feel safer and you better, knowing he can’t get up to any mischief while you’re gone! If your dog has never been crate trained, you’ll need to do that in advance. Waiting until you arrive at your destination and just opening the crate door expecting him to walk right in, isn’t the best recipe for success. Having said that, the crate isn’t the right thing for every dog. Since Red’s dementia has progressed, she hates being confined and would literally have a freak out if I put her in a crate. That’s why she can’t fly anymore. Sad! How’s your dog’s recall…and I’m not referring to memory! When your dog is off leash, how good is he about coming back when called? If it’s more of a “he comes when he feels like it” you may want to brush up on that part of his training. Even if you have no plans to let him run free, accidents happen and if he does get away, having good recall means a better chance of him coming back. Although traveling with your dog can be a ton of fun, if you’ve never done it before, at least not like this, you might want to consider taking a short trip first. So many new sights, sounds, experiences and smells can be unnerving, and given how much most senior dogs need their routine, it may be a rough adjustment. What about sleeping in the caravan overnight, even if it’s only parked in your driveway! If that goes well find the closest campsite and try that next. Before you bed down for the night, take your pup for a walk to burn off some energy, it will help keep him calm. As soon as you decide you’re going, get yourself a notepad and start jotting down anything and everything your dog could possibly need. Keep it handy, so each time something pops into your head you can add to it. Staying local? Traveling across the state? Across your country? To another country? and do it as soon as possible. There can be extensive paperwork involved, not to mention waiting times, so the sooner you start researching the better. You do not want to arrive at customs and find out your dog is not allowed in because you “missed” something. Trust me, I’ve travelled a lot with my animals and telling an animal control officer or border guard “I didn’t know…” will never work. If your travels will take you on a boat or ferry to reach your destination, be sure and find out if animals require a reservation. There is a limited number of pets allowed and spaces book up quickly. It goes without saying you’ll need to know, in advance, which sites are dog friendly. It’s as easy as doing an internet search for “dog friendly sites CITY/STATE/ COUNTRY.” Pet policies should be listed, but even if they are I recommend contacting the site directly to clarify. Things may have changed and the information not kept current. Is there an extra charge to bring a dog? Is it per day or per stay? Is there a limit to the number of dogs? Are there “no go” areas where dogs are not allowed? Must they be kept leashed? Can they be left in the caravan or motorhome? 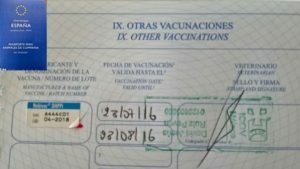 Is proof of vaccinations required? Any fenced in dog parks? Are there cafes and restaurants that allow dogs? Can dogs join you inside attractions? Does your car/caravan/motorhome insurance cover your dog? If not can he or she be added? What about your pet insurance? Does the policy cover your pup no matter where he is, or just in his hometown? What about accidents caused by someone else? Does any policy cover a holiday that must be cancelled due to pet illness or injury? If your senior dog has a harder time with change then she used to, why not get her used to the caravan before you go. Let her sniff around it, open the door so she can poke her head in, take her inside and give her some favourite treats. Why not sit on the couch for a bit with her, read a book and play some relaxing doggy music? 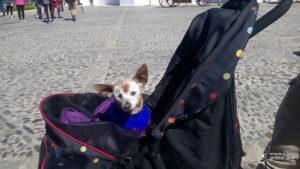 There’s a pretty standard packing list for dogs of any age, but when it comes to traveling with older dogs, especially if there are some health issues, you may find you have a few more items for the suitcase. Okay not technically something that is packed, but important to have in case the unthinkable happens and your dog runs off. Check all information is up to date, and have your dog microchipped as well please! In the event of spotty cell phone reception, an additional tag containing contact details of your destination (and/or next one if you’re on the move) is a safety precaution worth considering. Being in unfamiliar territory can be unsettling, accidents happen and your dog may wander and lose his way. It’s even more terrifying if your dog has vision and/or hearing problems. A GPS collar will increase the likelihood of your dog returning to you safely and quickly. Even if your dog does not typically wear a harness, I recommend putting one on him when traveling. If he gets scared it is way too easy to get out of a collar, and even if you’re sure nothing freaks your dog out I would get one anyway. If your dog spends more time off leash then on, you’re going to want to make sure you add it to your packing list. It’s a safety precaution in strange surroundings, not to mention it’s likely the caravan park you go to will have leash laws you must observe. If your dog is nervous or needs more space these days, there are vests, harnesses and leashes with “messages” for others to see. If your dog typically requires a bit of help, or you’re concerned you’ll be doing a lot more walking than usual and Rover (okay Spot!) won’t be able to keep up, here are a few items you may want to include. Having a current photo means no time is wasted getting the word out, should your dog go missing. If your dog has gotten fussy about the bowls he’ll use, bring yours from home. If he’s not bothered, than the ones you choose are of course up to you. You may want to buy some to keep in the caravan/motorhome or use disposable (sorry I know that’s not very environmentally friendly!). If your dog is having trouble reaching his bowls, perhaps now would be a good time to try a raised bowl. I always bring a foldable/collapsible bowl with me because they’re perfect for day trips. They take up no room in a knapsack, purse or even a pocket and you’re never caught without. I also always carry a bottle of water because Red is so much thirstier these days. Non spill bowls for water are handy while you’re on the move. Rubber mats are perfect for protecting your flooring from spilled food and drink. Although campsites have drinking water on site, I only use it for filling water butts. For everything else, including the dogs, I bring a supply of bottled. Find out in advance the flea and tick situation where you’re going, and if your dog’s current products offer the right level of protection. If it is a concern, there are plenty of indoor/outdoor sprays available, some with natural ingredients. Obvious I know, but in the excitement of packing sometimes the thing we need the most and don’t write on the list is the thing we forget to bring! Have a supply that will last you the length of the trip…and longer just in case you’re having such a great time you can’t bear to leave. It’s particularly important if your senior dog is on a special diet. 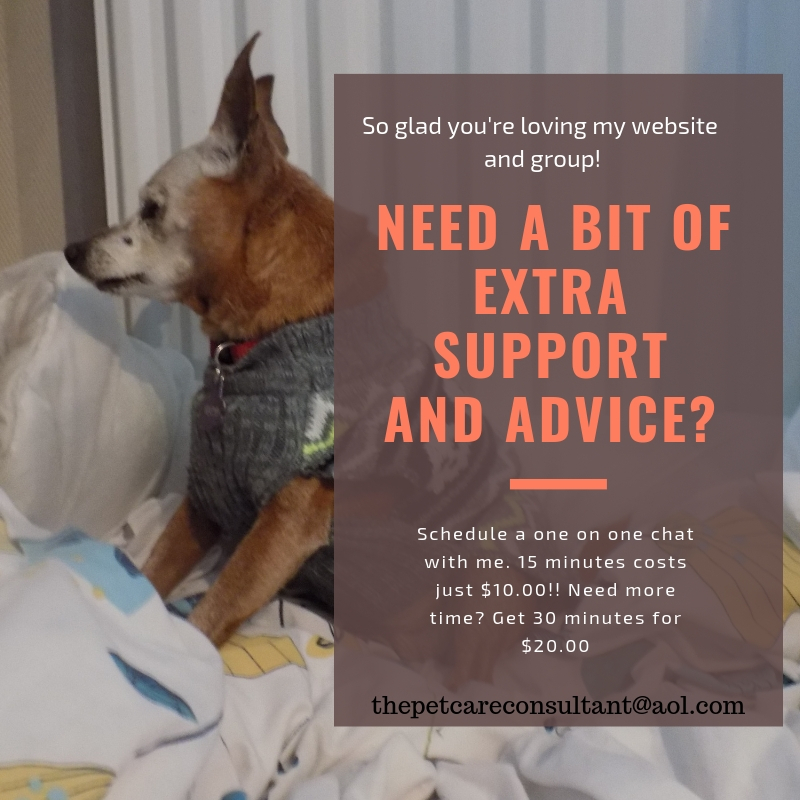 Food extras – If you’re like me, I add some home cooked food to my senior dog’s diet so I make sure I bring enough to last. Yes you can buy chicken anywhere for example, but I’m very particular about the type I buy so I bring a supply. Bring more than you need, and don’t assume you can replenish at a local vet and health food shop. Assume you can’t! Don’t expect to have your dog sleep “wherever.” Bring his bed so he has a comfortable spot and a couple of blankets in case it gets chilly. Traveling can be stressful on some animals, and many senior dogs can have a tough time in strange surroundings. If they have dementia they may be even more confused. Bringing some of his favourite comforts from home, including some much loved toys will offer comfort. Brushing your dog is such a great bonding experience, there’s no reason you shouldn’t continue it while on your travels. If it’s not something you typically do, now is the perfect time to start. If for no other reason you’ll cut down on the amount of dog hair you find inside! Drops in evening temperature, an unexpected rainstorm or caravanning in the winter means a sweater, coat and raincoat are must haves as far as I’m concerned. My senior dog Red has become a lot less tolerant of the cold as she’s gotten older, and wears a sweater most of the year, indoors and out. I never leave home without them! If your dog is prone to burning in the sun, don’t forget to bring some protection. If your dog has health issues or been treated for an illness recently, bring his medical records. I always have a copy stored on my email as well as a hard copy. Some parks may want proof your dog is up to date on vaccinations, and if travelling further afield, proof of rabies is always required. A very handy item to have in your home, car, cycle bags, boat, motorhome and caravan. Ready made kits contain the basics and usually include a booklet outlining what to do in case of various emergencies, or assemble one yourself. A first aid kit means you can attend to your dog immediately, but it won’t help in every situation. Red can take a turn rather quickly, so you can be sure I know where the local vets and emergency hospitals are, with numbers on paper and programmed into my phone. Precious time can be wasted while you search. As responsible dog parents, we never leave the house without a good supply of poop bags. Bring more then you think you’ll need, because re-stocking may not be as easy as you’re used to. If you use them at home you’ll use them while away. I always say I should have bought stock in a pee pad company I use so many of them!! I cover the caravan floor in them at night just in case. So handy to have, especially if it’s damp or muddy outside. A lot less fuss, a lot more convenient to use than a towel and water, and a great substitute if you don’t have access to either. A stake in the ground with a rope attached to your dog’s collar or harness will give him the chance to lounge in the fresh air in safety. Muddy paws are an issue when caravanning, it’s the nature of the beast. For me the nightmare is when it’s been raining, I’m wearing a raincoat and wellies, carrying Red who is squirming like crazy because she doesn’t like to be held for too long because of her dementia, trying to fit through a narrow door, while grabbing the towel and drying her off without me stepping off the doormat. Conversely if you have dogs that love to swim you know they’re going to roll around on your couches to dry off…right!! Yep you need lots of towels! Microfiber are a good option as well because they take up less space. An easy way to wash the mud off your dog, or just hold him under one of the faucets on the site like I do. Where would I be without mats by the door! Perfect for covering seating areas…even if it’s dry outside. In addition to your standard cleaning supplies, carpet and air fresheners make a good addition. If boating is on the agenda, or even just a possibility, bring a life jacket. Your dog may be a first class swimmer, but can get into trouble in unfamiliar or rough waters. At home I never have a problem with counter surfing because my dogs are too small to reach! In the caravan it’s a different story. Once Jack is on the couch it’s a very short hop onto the counter. Be careful what you leave out – food, sharp objects or anything else they can get their paws on that may cause harm. If you have a dog that’s suffering from chronic pancreatitis like Red does for example, you’ll have to be extra careful because counters in caravans are a lot easier to access than at home. In such a confined space it can be a challenge finding the best place to put the water bowl. After finding the “ideal” spot, I stepped in the water so many times I had to move it to another ideal spot. If your dog drinks a lot more these days and you have room for a second bowl that’s great, if not get a bigger bowl. I have 2 dogs and 1 bed. Our dog Jack sleeps with us at night, and Red sleeps in her bed on the floor. During the day both prefer the couch. Vents – you don’t want them blocked with a bed or blowing hot or cold air on your pup all night. 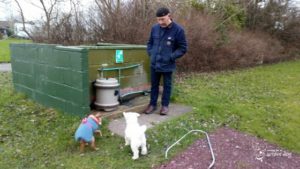 Middle of the night pee breaks – yours not theirs! Be sure the bed is not in the path between your side of the bed and the bathroom. Blankets and throws can move and be pulled down, but removable and washable seat covers will save the upholstery from dirt, mud and sharp claws! Unless you know your dog travels well and has no problem with car sickness, it’s best to lay off the food before you go. Wait until you get to a rest stop for a decent break then feed him. You will still need to have fresh water available at all times. The sooner you arrive at your destination the sooner you can plug in, fill up and chill out…and who can blame you. You want that relaxation time to start asap. For the sake of the four legged travellers it’s best to stop regularly, every couple of hours or so to let them pee, poop and stretch their legs. Don’t forget a snack if they haven’t eaten, and to keep them well hydrated. I have to be very careful and keep an eye on the clock because Red eats 5 meals a day. If she’s sleeping I don’t wake her, but if she isn’t I make sure she sticks to her feeding schedule as much as I can. She also drinks a lot more nowadays so I give her water during the drive, even though it may mean a few extra pee stops. They only take a second so very little time is lost. During those breaks keep your dog on a leash and harness, and open the door slowly. While there are quiet rest stops, those with gas stations and restaurants tend to be noisy, and can be unnerving. 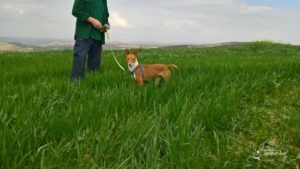 Once you arrive at the site, get your dog settled in as quickly as you can. Set up his bed, take out his favourite toy and give him a treat. You want to make him as comfortable as you can in his home away from home, so pay him lots of attention. One of the most important things you can do when traveling with your senior dog is to try and stick to their schedule as much as possible. The familiarity of a routine will give comfort in the unfamiliar. I know it isn’t always possible, especially if you’re driving, so try and schedule your stops around their usual meal times and bathroom breaks. Sorry to be so blunt but it’s true. During our last trip there were days when all the rains in the heavens were beating down on us. 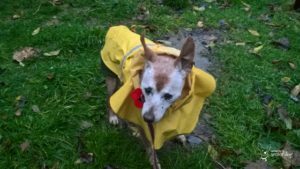 If you and your pup are happy to put on the wet weather gear and hit the road, fantastic, but if you aren’t…Some of the same activities you do with your senior dog at home can be done while away, with modifications when needed. If mental stimulation is not something you’ve been doing, now’s the perfect time to start. Bring an interactive puzzle toy with you and challenge him to figure it out. Mental stimulation is as important as physical exercise, and did you know it can help expend energy? Treat dispensing toys will keep him busy, even for a short time. Want it to last longer? Stuff a Kong with some peanut butter, chicken, doggy ice cream anything your dog loves and put it in the freezer. Teach him a new trick and brush up on old ones. How about some homemade games? Turn 3 cups upside down, put a treat under one when your dog isn’t looking then say “find it” or words to that effect. As he’s searching use your chosen words so he will associate the cue with the action. Or take a muffin tin, put treats in a few of the spaces, then place a tennis ball on top of each section and let your dog find it. These are just a few ideas, but I’m sure you can come up with lots of other great boredom busters. 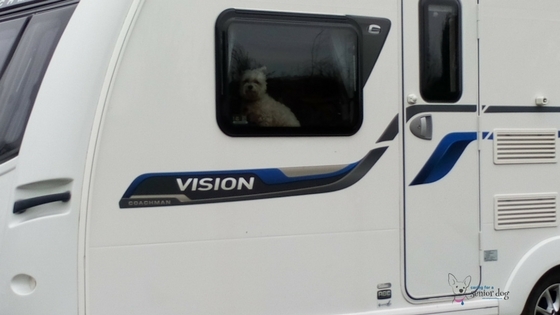 Some pet parents are okay going out and leaving their pup in the caravan or motor home, while others wouldn’t dream of it. I’ve done it but my old caravan had an extra security option with a handlebar that could be moved across the door and locked. Our current one does not, so I am not comfortable leaving them. In addition to safety considerations there’s weather as well. We know how quickly the inside of cars and vans heat up, and how even a couple of minutes can be deadly for our pets. Parking in shade and leaving the windows cracked open on the safety latch are unlikely to be much help, so it’s safer to take them with you. In the winter leaving the heat on should be enough…unless it breaks down for some reason. My husband says I’m negative, I say I’m cautious! Did you know some roadside assistance companies may have restrictions on towing vehicles with pets on board? You might want to check if your policy does and if yes what, if anything, can be done in the event of an emergency. Well we’ve come to the end of this post and I did my best to cover everything I could possibly think of. If I’ve missed something I would be happy for you to leave a comment below and I will add it. 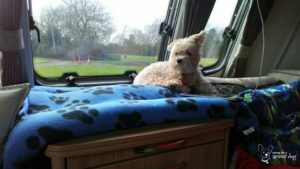 If like Red your dog can no longer fly, or you don’t like the idea of flying with a senior dog or any pet for that matter, caravanning is certainly an option. A road trip is a lovely way to explore…and you don’t have to leave your best friend behind. *There are affiliate links in this post, which means if you purchase anything I make a few pennies…literally. That money helps me help homeless animals through donations and fostering, as well as keeping this blog running. You’re right it absolutely doesn’t make a difference. Preparation is key no matter what. MAKE THIS AN EBOOK today its fabulous. Thank you Marjorie, thanks for the suggestion it’s much appreciated!! We didn’t have a caravan but an old bus which kind of served the same purpose. We did need a ramp for Jasmine to get in and out safely. There were sacrifices–there was a “couch” which was meant for me but Jasmine would like to get on, then got too hot and wanted to get off, and so on … so we always spent any longer trip playing musical chairs. Sounds like fun, and lots of happy memories! We seldom travel by car and do not have a caravan but you certainly have great tips for traveling with dogs. As you say it is important to stop frequently. I guess when my husband retires we will be traveling more and driving not flying so this is very helpful. Thanks! What’s good to know is how much those tips apply no matter how you travel with your dog…or cat!! Wow! What a comprehensive list you’ve created for people traveling with their dogs! I would love to have an RV or motorhome to travel with my dogs in. It would make things so much easier than staying in a hotel. Your reminders about what to bring with you are terrific as not all of those things most people will remember. Particularly important, as you say, if you are traveling out of the country. Thanks Stephanie!! While I do love the comforts of a hotel, going on a vacation in an RV or motorhome is a completely different experience. I also think it’s a lot more fun for the dogs. I know I’ve stated the obvious many times in the list, but it’s incredible how the most obvious things we use every day are usually the things we leave behind.